This week’s #TeamFYNSports Sports Writer Player of the Week is Junior offensive lineman Aidan Sanchez. 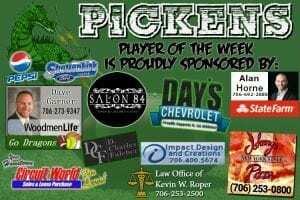 Aidan, along with the rest of his teammates on the offensive line, helped create holes for a running game that gained 298 yards, and kept the pocket clean for QB CJ Streicher to throw for 139 yards and complete 9 of 12 passing attempts in a 48-0 win over Heritage last Friday. On the season, the Dragons offense has totaled 902 passing yards, & 2,316 rushing yards for a total of 3,218 yards through 7 games. That’s just about 460 total yards per game. The 2,316 rushing yards, & the 3,218 total yards tops the 4A classification, & is good for 5th in the entire state of Georgia. A lot of that success, can be contributed to how well the offensive line has done this year. The big guys up front have put in a ton of work on and off the field and it is showing. 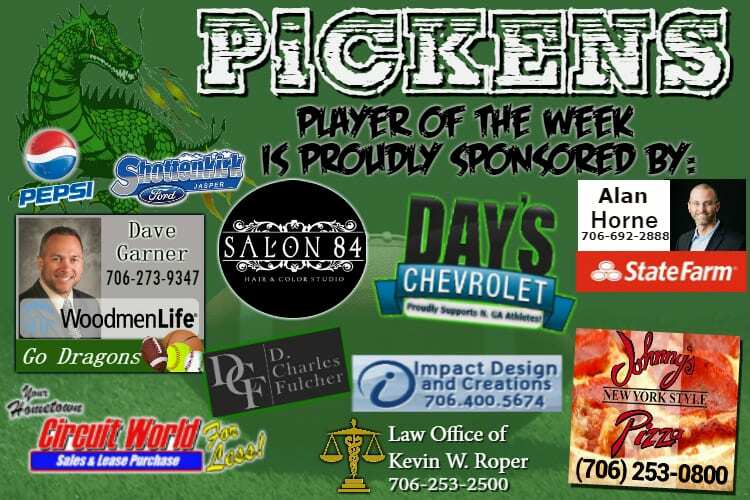 Catch Aidan and the rest of the Pickens Dragons as they travel up to Northwest Whitfield, to take on the Bruins in a big time region game. Kick off is set for 7:30 pm.